Submitted by General Specific on May 9, 2010 - 11:31pm. Great, now I want a hamburger. Submitted by reynard61 on May 9, 2010 - 11:40pm. 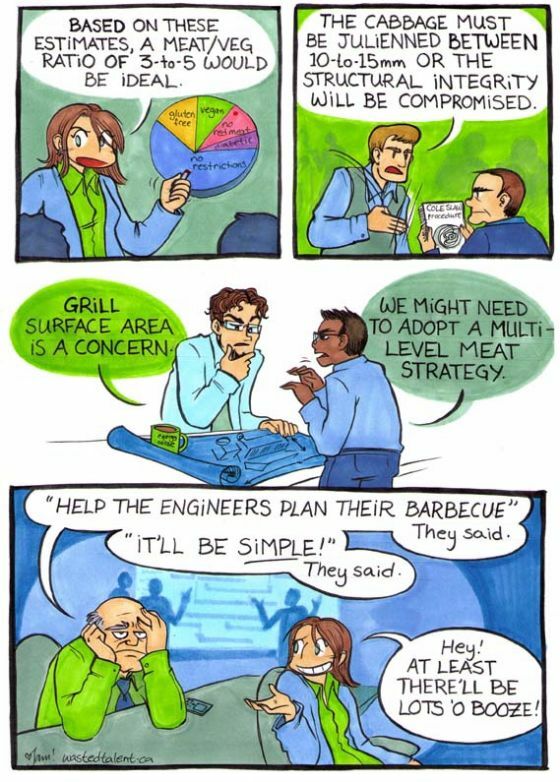 I'm not an Engineer (regrettably), but I've done this myself when I had to help set up and cook for an annual Star Trek club picnic. My job was to coordinate/schedule the use of two grills and an outdoor stove to cook about 125 lbs. of meat and side-dishes for around 95 people. Luckily, I managed things with surprising efficiency and I even got to have some actual fun once the last item went on the grill. Submitted by slick kat on May 10, 2010 - 2:13am. Submitted by larofan on May 10, 2010 - 4:17am. Submitted by aj2x on May 10, 2010 - 6:39am. This is so right-on for an engineering group! The only other thing that strikes similar fear into the hearts of food-service people is when a group of engineers sets out to figure the exact amount each of them owes for dinner! Submitted by rubiksnerd on May 18, 2010 - 4:50am. And then when they go to pay a $200 bill with 12 different cards. Submitted by SpilledInkGuy on May 10, 2010 - 6:50am. Submitted by Pokota on May 10, 2010 - 10:39am. Heh, and I thought our Math Department was bad about planning stuff. Submitted by Serbian Goth on May 10, 2010 - 11:20am. Submitted by Jay on May 10, 2010 - 1:39pm. Is there a favourite button? Submitted by Jam on May 10, 2010 - 2:49pm. Submitted by wasted Tom on May 11, 2010 - 1:06pm. Ah yes... I was also wondering about that. But actually it seems you can't "favourite" a past comic when sailing through the archive or asking for a random comic. The "favourite this" link is not visible. Submitted by Jam on May 11, 2010 - 2:48pm. Oh, hey, you're right, Tom! I'll flag this for Trevor's attention. Submitted by Jam on May 14, 2010 - 3:53pm. Submitted by kriztov on May 10, 2010 - 6:14pm. I'm in IT. We order pizza online and then criticize their website. As for grilling, well I'm going to have to see if you can control a grill over wifi. Submitted by kriztov on May 10, 2010 - 6:15pm. Can you install linux on a grill? Submitted by Alaith on May 14, 2010 - 11:31pm. Delux BBQ with 3xUSB port! Submitted by Redherring on May 11, 2010 - 2:30am. Submitted by 0netnet0 on May 14, 2010 - 11:51am. And with each sauce, how much would be too much, and how much would be too little? You need to calculate the tastiness of each possibility and then figure out the perfect suace to meat racio for each possible combination. I've just added you a week's worth of arguing havn't I? Submitted by RoboTart on May 11, 2010 - 5:03pm. Totally unrelated, I just noticed that you don't capitalize your "i"s.
Submitted by Jam on May 11, 2010 - 7:14pm. Submitted by Ephraim J Witchwood on May 17, 2010 - 7:19am. Submitted by CrazyDreamer on March 27, 2011 - 4:39am. An engineer friend of mine spoke at his college graduation. Among other things, he discussed how you know you're an "enginerd" if you discuss the structural integrity of your food. Most of these are direct quotes, sadly. I will have you know, however, that the coleslaw was fantastic.